Italy’s Corriere di Bologna report Leeds United have made a ‘request’ to take Filippo Inzaghi from Venezia. 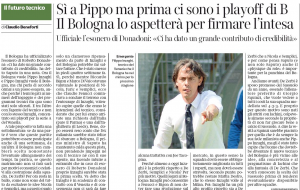 Inzaghi is one of the main candidates to take over from Roberto Donadoni at Bologna, and there’s confidence from the local newspaper that an agreement can be reached. If it isn’t, Corriere di Bologna say it will only be because of the finances involved and the make up of the team next season. Inzaghi is ambitious and he’ll hardly want to take over Bologna if he feels he’ll be doomed to failure from the start. Talks have been ongoing for four weeks, and it’s believed there’d have to be something go wrong for the move not to happen now. So where do Leeds United come in? It’s explained that Bologna have some competition. Parma are presented as a club who may be interested, having superbly fought their way back to Italy’s top tier, and it’s claimed leeds United have made a ‘request’. That would almost certainly mean they’ve contacted the manager or his representatives to let them know of interest and the potential to take over at Elland Road. Inzaghi is currently in the play-offs with Venezia, and his contract ends this summer. Bologna finished 15th in Serie A last season and are of course an attractive proposition. It would seem quite odd for Corriere di Bologna to just imagine up Leeds United interest, so there may be something in this at some level.